On Friday 15th March Ruthin School held a 5 km Race for Life “Schools” event to raise money for Cancer Research UK. The route twisted around both the front and back fields, offering a challenging course for the elite runners but and first-timers alike. Over 250 people took part, donating a minimum of £5 each to run. 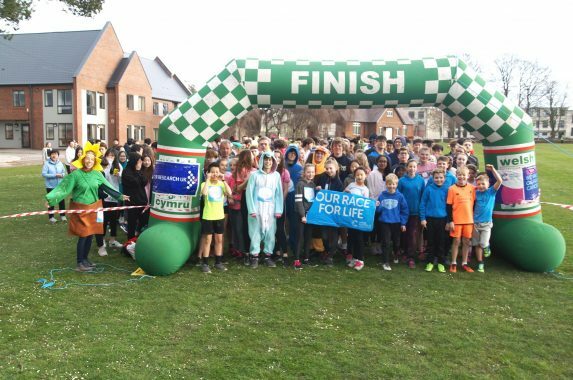 The majority were Ruthin School students, many of whom are more used to a fairly strict academic regime and completing a 5km run represents a significant achievement. Other runners included friends and family along with several members of staff. Of course the emphasis was very much on participation and fancy dress was a major theme. Our winner, Fred Flintstone, crossed the line in a speedy 19 minutes and 52 seconds. The costumes added a huge sense of fun and we had Batman, Tinky Winky, Mario & Luigi, a plethora of animal onesies, air inflated blimp suits, an evil clown, a sunflower and even some cross-dressing! The School Principal, Mr Toby Belfield, also took part completing the event in his suit and shoes! Two of the physics teachers decided to increase the challenge by simultaneously completing a GCSE biology paper! 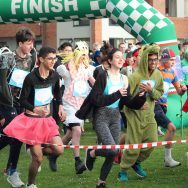 Of course, behind the fun was the prime objective of fundraising and the entries accumulated to £1,663 (with a further £389.50 from Gift Aid). This totally eclipsed the target of £1000 and was more than double the amount raised at the previous event held in 2017. Many thanks and congratulations to everyone who contributed to this successful event and helping to benefit such a worthy cause.